Supremely elegant, this holiday apartment in the heart of town has undergone a recent interior transformation. The emphasis on quality is on show at every turn exquisite furnishings and sumptuous dcor combine with an incredible location. The well laid-out unit has a two bedroom apartment with full kitchen plus a separable studio room. Each bedroom has a beautiful tiled bathroom with under-floor heating. In the front building of the Beacon complex, huge windows allow holidaymakers to soak up the lake and mountain views at their finest. 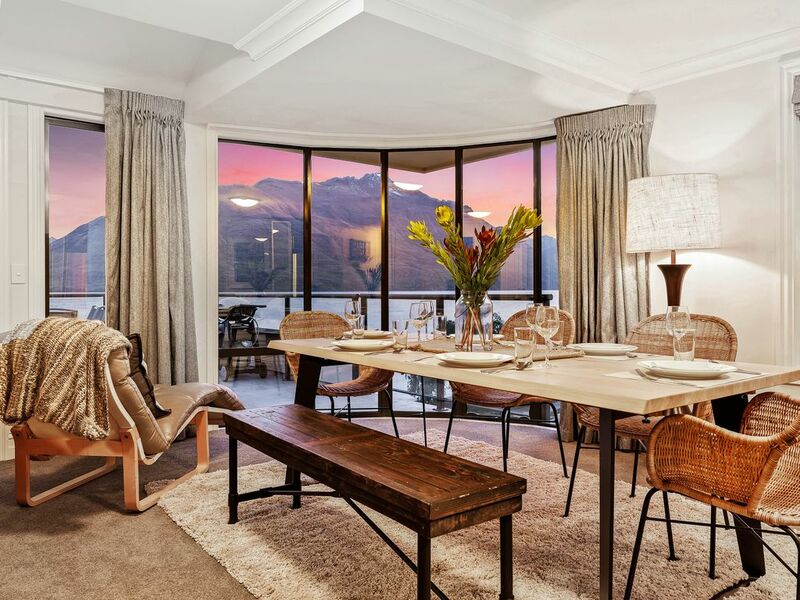 Plush carpets and rich throws craft a cosy ambience through every Queenstown season. Bi-fold doors open the generous living area up to a large deck showcasing the gorgeous vistas. Perfect for enjoying an evening drink outside or taking a dip in the luxury spa bath, also situated on the deck. New, top-of-the-range beds in a flexible configuration offer a decadent haven to sink into at the end of a wonderful day in the mountains. Nespresso Machine, x10 coffee pods provided per stay, can add more to booking for a cost of $12 per 10 pods. The apartment is great - Very large, well equipped, 3 nice bedrooms all with ensuite. The apartment is great - Very large, well equipped, 3 nice bedrooms all with ensuite....and a HUGE balcony with spa overlooking the lake....what else can one ask for. Great location 4 mns walk from the shopping/restaurants strip. We had a wonderful stay at 408 Beacon. We had a wonderful stay at 408 Beacon. The location is perfect, being right across the road from the lake and only a short 4 min stroll into the centre of town. Clean and well furnished apartment with generous space. (the only thing missing was a full length mirror). Wouldn't hesitate to stay here again, or recommend to friends. Location is perfect, easy access, roomy & comfortable & has everything you would want in an apartment. We will be back! cheers, regards, Greg & Larraine. location is perfect, and views are the best! location is perfect, and views are the best! !